Size: Set of Two, 14" x 20"
All Personalized Baby Gifts are Created & Shipped in 10 Business Days or Less. 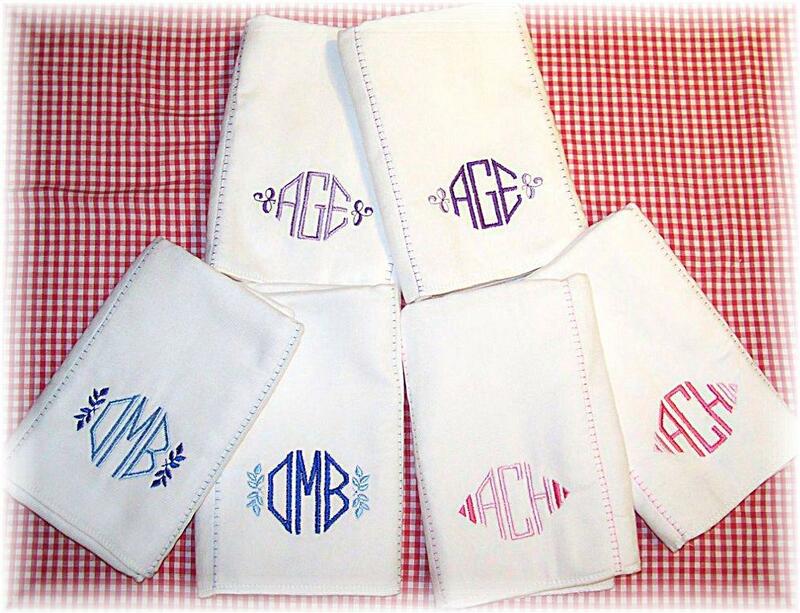 Monogrammed Burp Cloths. 100% Cotton Heavy Duty Diaper Service Quality Diapers - Used as Burp Cloths. Two white nappies embroidered with your choice of monogram. Each fluffy diaper measures 12" x 15". Accent Design: Chevron, Curly-Q or Laurel. "See Accent Designs"
Embroidery: Select Lettering Color and Accent Design Color. Embroidery colors are reversed on 2nd nappy. These are simply too pretty to use! I think I will put them in a shadow box for the nursery. Beautiful work! I've been using Baby o Baby for years for all of our employees and clients when they have a baby......Alison and team truly does remarkable work, and our employees always are so impressed when they receive something that seems so personal....in a world of big box businesses and fast paced automation, BabyObaby is a breath of fresh air! I can't tell you how incredibly impressed I am with the level of customer service, the personal email and the absolutely outstanding finished product!! I can guarantee I will use your service again and again. Many many thanks!! These burp cloths are perfectly elegant! They keep getting better and better. Alison~ I am so impressed with the quality of your work! Not only on the burp cloths but, on your exceptional level of customer service. I will absolutely be a returning customer and I will share your website whenever and wherever appropriate. Great job! These are not only the most elegant baby gift we received---they also were one of the most practical gifts too. So pretty we did't want to use them but, we were so thankful that we did. It just made us feel so special. We will be giving these from now on. Thanks! I just ordered a set of your monogrammed burp cloths for my sister who just gave birth to her first child. A good friend gave me one of your sets just after I gave birth to my daughter and I can't tell you how much they mean to us. I am so happy to be able to share that joy with my sister. Thanks! This is my favorite baby gift to give. Classic, fresh and presented in such a lovely fashion. I am a customer for life. These are just the prettiest burp cloths I have ever seen. I really didn't know what to expect when I opened the little gift bag...when I saw the monogrammed burp cloths for my newborn daughter...I couldn't help but cry. Thank You. This was the BEST gift I received after my twins were born. Now, I order them for everyone! I wanted to share with you that I finally got to visit my brother and his wife and my new nephew in California...and was shocked to see that they have never used the monogrammed burp cloths that I sent...instead they had them FRAMED! I just ordered an identical set so they will get to use them too! This is my favorite thing to give. We got a set as a gift and I just loved using them. It always made me feel so special when I used them and I love to share that feeling with all of my new mom friends! Alison, This is simlpy the most elegant baby gift I have ever given. Thank You, They are gorgeous!